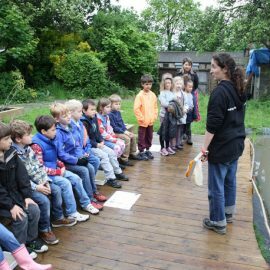 Groundwork London has been delivering a range of environmental education workshops at Wandsworth Nature Centre throughout the summer and autumn. The workshops gave children from across Wandsworth an opportunity to get out of the classroom to get hands-on with nature, creating more memorable learning experiences and making wildlife discoveries for themselves. Utilising the Centre’s classroom and education resources, children were able to explore the Centre’s garden and newly restored pond to learn about minibeasts and to get close-up to the pond’s many newts, and had the chance to roam the Common to learn more about the different habitats that make up this wonderful green space. The sessions are available every Friday from April 2017. For more details, contact Michael at Groundwork London on 020 8762 0354 or naturescope.education@groundwork.org.uk. Copyright © 2015 NatureScope. All rights reserved.